Cost: $11(mini) - $22(large) for month-to-month subscription, cheaper with prepaid plans. Nail-, Body-, or Soap-only bags also available for $12.50 month-to-month. Free shipping for all subscriptions. Fun Extra: DIY mystery bags are also available: RH sends you everything you need to make two of your very own nail polishes or glitter toppers! Strawberry Peach Sangria Perfume Mist - sweet and summery strawberries and peaches blended into a light rose wine . You had me at Sangria. Also strawberries and peaches are my two favorite fruity scents so I don't think there's any way I wouldn't have liked it. And guess what...it smells even better than it sounds. Nothing really sangria-ish about it but I'm gonna let that slide because I think the scent of wine would have taken away from the sweetness. I'm going to use my rewards points to get a full size version of this mist. I should also note that this perfume is alcohol and paraben free. This baby has Win written all over it. Melon Cucumber Breeze Perfume Body Balm - classic cucumber melon essence with a Rainbow Honey twist. 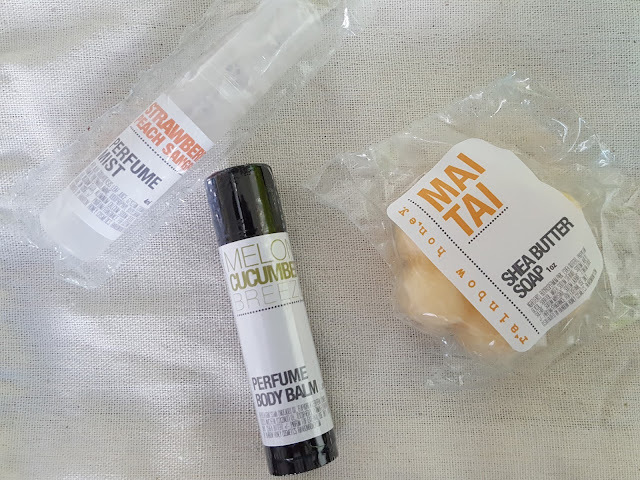 I haven't unwrapped this perfume balm yet since I'm currently using the perfume mist, but this body balm has the added benefit of nourishing skin. RH's body balms contain vitamin E and shea butter, and now in a warm weather-friendly formula just in time for summer! Cucumber melon is the perfect summer fragrance and I have high hopes for this one. Mai Tai Shea Butter Soap - a lush blend of island cocunuts, pineapple, orange and rum. Sooo I think I have a problem. I keep buying bar soaps because they smell good, but I never get to use them all because each one lasts sooo long. And I guess that could be a good thing, but when you have 50 bars of soap (plus 10 months worth of liquid soap/body wash from B&BW) it's kind of difficult to go through every single one. I think tiny soap bars like these are perfect - they smell good yet won't take forever to use up. That said, this soap smells alright but isn't one of my favorites. It definitely doesn't come close to strawberry peach sangria! I guess you could say it's like a mai tai, minus the coconut (but honestly I've never had a mai tai with coconut in it anyway, and I live in Hawaii). Strawberry Peach Sangria Nail Polish - this cool, strawberry peach creme nail lacquer with holographic glitters and iridescent shimmer is a stunner on the beach or holding a glass of your favorite summer drink! This is my new favorite scent in paint form and I am not the slightest bit disappointed. The shade is exactly how I pictured it would be, and the added red, white and iridescent glitters make it even prettier. I would be wearing it right now if it weren't for slicing my finger right by my nail while cutting carrots the other day :( Acetone will probably make me cry. Looks like I'll be keeping my current manicure for the next couple of weeks! Melon Cucumber Breeze Nail Polish - our creamy melon cucumber nail lacquer is accented with glitters and shimmers to bring out the sweet breeze of this iconic summer essence! Again, this is exactly how I envisioned cucumber melon nail polish to be. 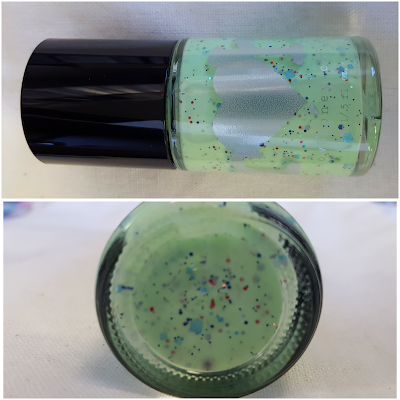 This one's got some chunky light blue and white glitter that might require some fishing out, but even if you don't get any you'll still have the smaller red and dark blue glitters to make your nails look pretty. So what's the verdict on June's mystery bag? Well if it wasn't already obvious, I'm kind of in love with the strawberry peach sangria scent and it's going on my To Buy ASAP list right now. I'm also glad that both nail polishes contain glitter because I'm a glitter fanatic and Rainbow Honey is my go-to place for glitter polishes. This is exactly why I re-subscribed, guys! 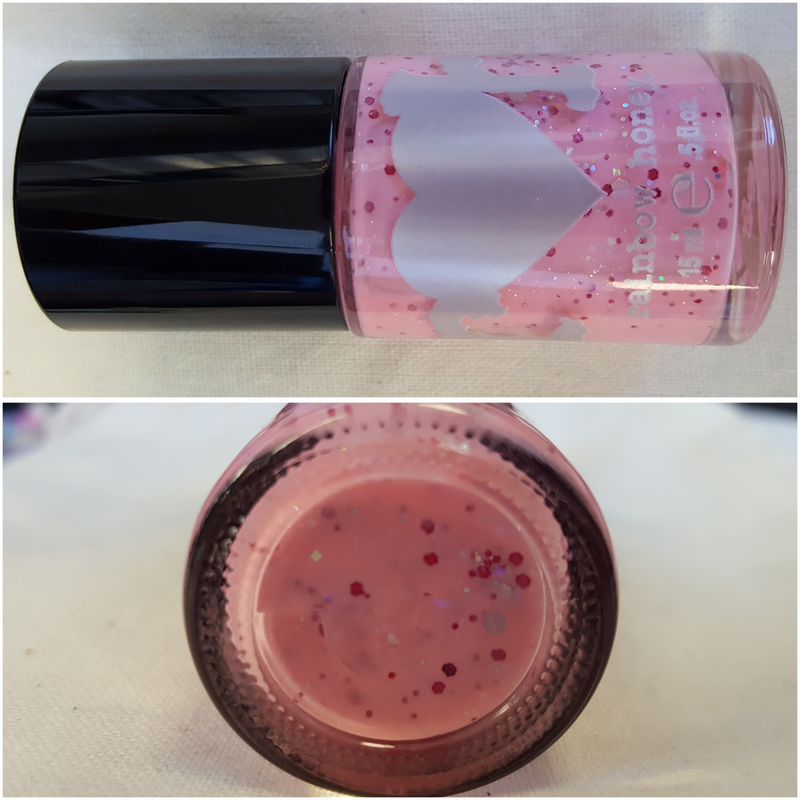 If you love fun novel indie nail polishes as much as I do, RH is reasonably-priced, and their soap and body line is something worth looking at, too. Their mystery bags are a fun way to introduce yourself to what they have to offer, and you can subscribe to that here. Or pick up a prepaid subscription to save a few bucks.